The oblong scarf measures 13 x 60. It contains blocks of color in black, silver and several shades of plum. This corded necklace is made using satinique cord in combination with nylon cord. The length can vary from about 16 1/4 to 19 1/4 inches with a center jeweled piece that adds 3.5 inches. 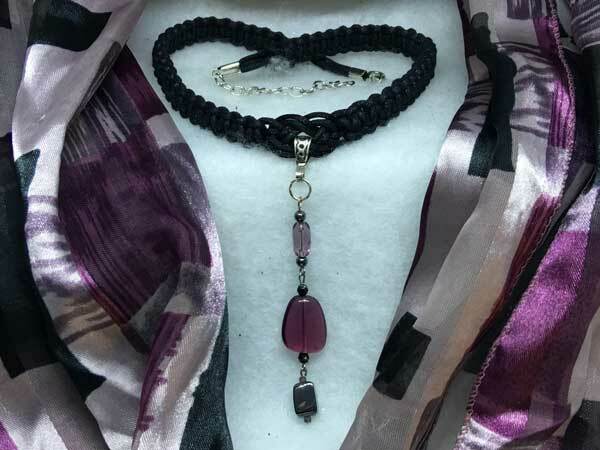 The cord is solid black, one cord shiny, one matte The jeweled piece starts with a twisted glass piece in light plum, surrounded by small round hemalyke beads. Hanging separately is a dark plum acrylic piece that sits between two fully-faceted black rounds. Hanging from this, is another hemalyke piece that is surrounded by plum seeds. It is a fun piece with a lot of movement and it coordinates beautifully with the scarf.